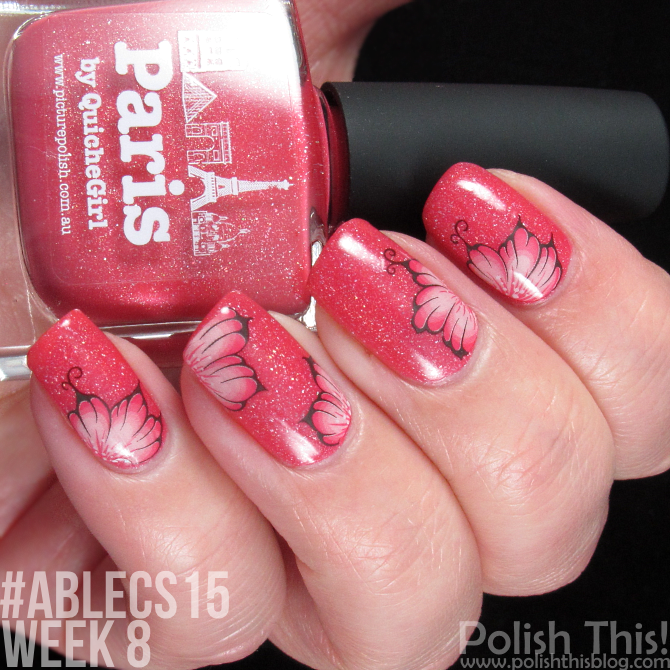 #ablecs15 Week 8: Monochromatic - Polish This! I had way more ambitious ideas for my monochromatic manicure for the #ablecs15 challenge, but I just started in a new job this week, so I just didn't have time to do what I originally had in mind. I'll definitely do that mani at some point, but for now I have quite basic manicure for the theme. Monochromatic, so basically all colors of a single hue. I decided to go with pink for this manicure and use one of my newest Picture Polishes for this manicure. I really wish I have had time to do something more complicated for this theme, but like I said, at this point I just had to go with this one. There's really nothing wrong the mani though, it's a really pretty one and I loved it. I'm not completely sure wheter PP Paris is the best match for my skintone, but I don't really care as the polish is so pretty. Kiitos paljon! :) Paris on kyllä todellinen herkkusävy, suosittelen!